This villa offers guests luxury, starting with its view of the 13th hole of the Royal Westmoreland Resort’s golf course. There’s plenty of room for guests to spread out, and tons to do at the Royal Westmoreland Resort 10 minutes away. Play a round of golf on the championship course, or ride the shuttle down to Mullins Bay and get full beachside service. The villa has a game and media room with more than enough fixtures to keep everyone entertained, such as table tennis, a play station, and air hockey. On top of all that, the Westerings staff will make sure you don’t lift a finger during your stay. Westerings is elevated above the Royal Westmoreland Resort’s golf course, with ocean views across the 13th hole. This spacious villa has entertainment and amenities for all ages. Outside, the expansive terrace stretches across the property, connecting the pool, hot tub, main house, and guest cottage. Lounge chairs line the freeform pool, and the al fresco living and dining area is under the covered patio. A wet bar gives guests the chance to have a poolside cocktail or make drinks for a tournament in the game room. The villa’s game room is fully equipped for friendly competition, with foosball, table tennis, pool, air hockey, and a play station. For more active entertainment, guests can workout at the gym or play a round of golf at Royal Westmoreland Resort facilities a short walk away. 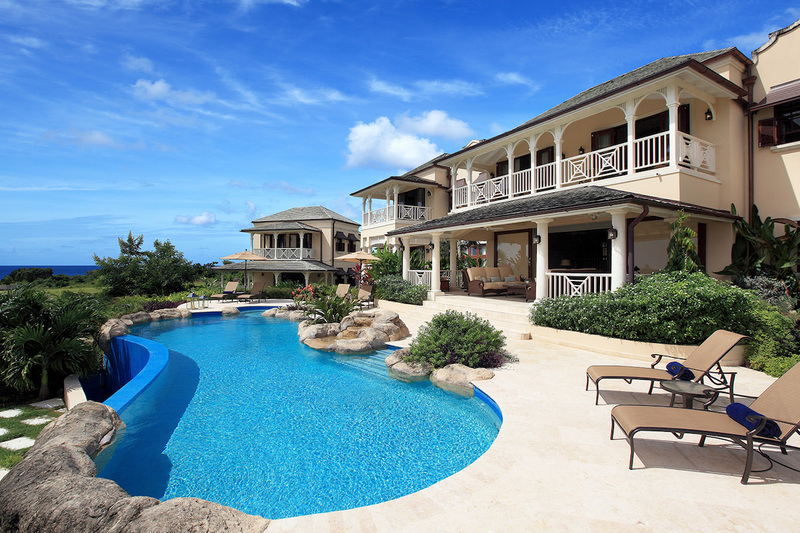 The villa also has beach access to Mullins Bay, where Royal Westmoreland provides sun beds, towels, and waiter service. The terrace opens to the main house’s open plan lounge and kitchen, which feature top of the line equipment. The main house is equipped with a multi-room audio system with wall pad controls, and the kitchen has modern appliances and a center prep island. The media area has cable TV, a DVD player, and plush couches. Each of the five bedrooms in the main house has an ensuite bath and air-conditioning. The Master Suite has a king-sized bed, walk-in shower, and bathtub. This room has the most privacy, with an in-room lounge, dressing room, and covered terrace. Three of the other bedrooms have king-sized beds, and the fourth bedroom has two twin beds that are perfect for children. The guest cottage is perfect for guests who want independence and privacy, while still being near the pool and main house. It has a kitchenette and lounge with a pull-out sofa bed, so guests can make and enjoy snacks or drinks without going to the main house. The cottage bedroom has a double bed with an ensuite bathroom and air-conditioning. Westerings is only 5 minutes by car to groceries and fine dining, and guests also have access to a golf cart they can use to drive around the Royal Westmoreland facilities. Bedroom 6: Also offers a pull out sofa. Complimentary Beach Shuttle to Royal Westmoreland beach facility at Mullins. Complimentary use of Westerings house golf buggy Access to Tennis, The Sanctuary and Gym Facilities at Royal Westmoreland Club are included.